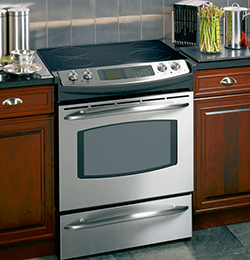 Area Appliance Service is the leader in local residential oven, range, stove and cooktop repair in Buffalo Grove and Arlington Heights. We are simply the BEST, MOST reliable, and affordable appliance repair company around. Let our gas, electric, built-in, and double oven repair technicians set your mind at ease by repairing your kitchen equipment fast and efficiently. Area Appliance Service techs arrive on time, uniformed, and fully prepared to deliver accurate repairs to your broken ovens. Feel free to give us a call at (847) 459-8070 to speak to a LIVE appliance repair operator whom will guide you through our repair process. You can also schedule an appointment online 24 hours a day. As always, communicating with us is NO charge, NO obligation, and NO cost. If it’s more cost effective for you to just buy a new stove or oven, we will let you know before any repairs start. Time is money, let our flexible scheduling work for you. Area Appliance Service realizes that your time is valuable and limited. When it comes down to a loss of a gas or electric oven, cooktop or stove at your residence, you’re literally burning through your household budget. Taking days off work to get repairs done and juggling schedules, we offer emergency same day repairs. No need to draw out long, time intensive, laborious repairs. Techs will call 30 minutes before arriving punctually. Trucks are loaded with common appliance repair parts for top brands including Wolf, GE, Maytag, Kenmore and others. Our customers are treated with care and the utmost respect, which is why we’ve continued to flourish in this industry for decades. My oven or stove will not heat up. My oven doesn’t bake or cook evenly. The stove broiler has a problem. My cooktop surface elements won’t work. My range burner does not ignite. My oven has a temperature issue. The stove light is out or will not turn on. My oven will not turn on. My oven has a self-cleaning problem. My oven or stove won’t turn off completely. The range surface or cooktop element won’t turn off. My oven door is in serious need of repair. My stove fan keeps running. My range or cooktop burners spark all the time. Schedule Service for Your Oven or Stove Today! Area Appliance Service is here to stay, with about 60 years of excellence. All of our oven, stove, and cooktop repairs come with a Warranty on ALL oven parts and a Labor Guarantee up to 12 months. We stand behind our family owned and operated business, and will continue to do so for many generations to come. Reputation is everything, and we encourage your feedback. Learning and improving never stops. There are obviously many other companies in the appliance repair market, so we appreciate you giving us a try and we will handle your situation seriously, promptly, and at an affordable cost. We are also bonded, licensed and insured!